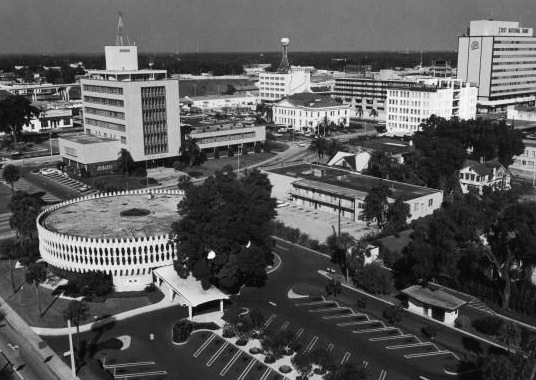 The view looking north up Orange Avenue is framed by city hall on the left and the mid-century modern American Federal Savings and Loan building (AKA The Round Building). Tall palm trees center the postcard, behind them are the Downtown Motor Inn, Sun Bank and the American Fire & Casualty Insurance buildings. 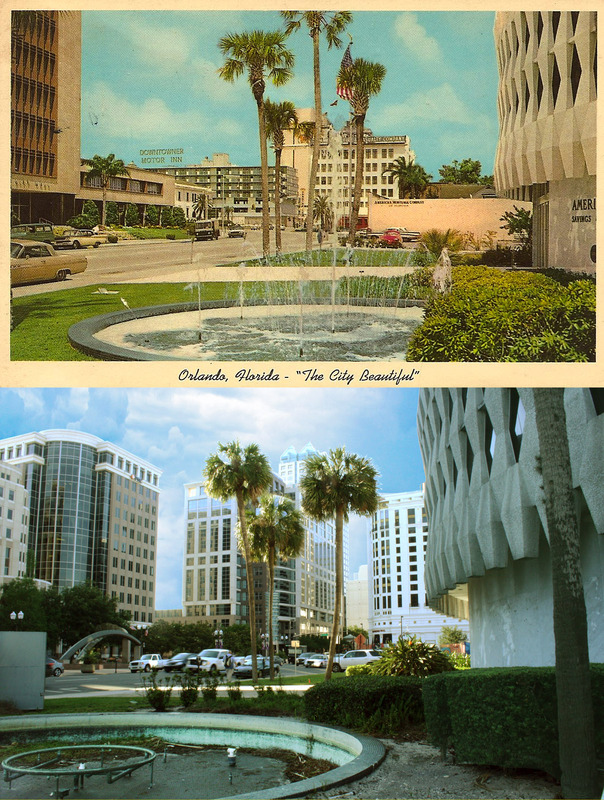 The view today looks similar to the 1960’s postcard even though all but one of the buildings in the postcard have been demolished. City hall was replaced with our current city hall. SunBank – now SunTrust – rebuilt near the same spot. The Downtowner and the American Fire & Casualty buildings are long gone. Now the Grand Bohemian sits on the corner. And at least for today, the former American Federal Savings is the only remaining building. 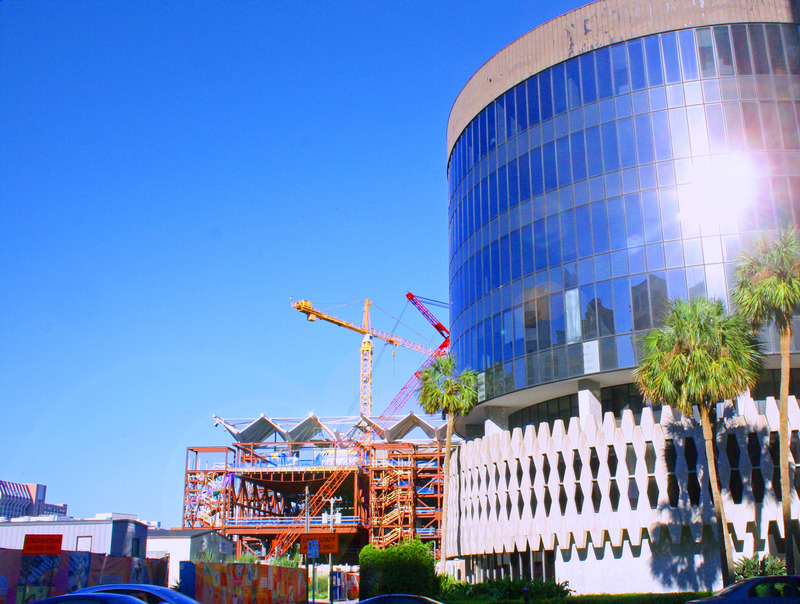 Today: Dr. Phillips Performing Arts Center under construction behind the Round Building. In 1961, American Federal Savings and Loan Association purchased 60,000 square feet of property across from City Hall for $400,000. At the time, there were still some homes along this stretch of Orange Ave. A few houses and a four-unit apartment building were on the site when the bank bought the land. The close proximity to Lake Lucerne probably made this a very livable area, which would not be true today with the 408 Express overhead. Robert Murphy, a local Harvard educated architect who later founded HuntonBrady Architects, designed the building. HuntonBrady continues to design buildings today. Their credits include Team Disney, The Mennello Museum of American Art, and the Orange County Convention Center expansion. Mr. Murphy designed the bank as a round building encircled in decorative concrete panels (the bris de soleil). It was originally built at only two stories. With equally important east and west entrances, the round design helped keep an even traffic flow. A head teller from the bank had the idea for a semi circular teller counter being the most efficient way to serve customers. A skylight in the center added natural light to the bank lobby. When it first opened, the bank created further attraction by putting $1 million in bills on display in the lobby. American Federal Savings and Loan in the early 1960’s before the additional floors were added. In the early 70’s, additional glass enclosed stories were added to the building. This changed the appearance to a sort of office tower rising from the decorative concrete. Visual Ephemera recently quoted Mr. Murphy’s wife as stating he was not fond of the added floors. Left: Bris de Soleil panels being installed in 1960’s. The days are numbered for The Round Building. Today, three old palms tower over the dry fountain at the west entrance. It will be demolished to make room for the Dr. Phillips Performing Arts Center currently under construction. There are efforts underway to remove and repurpose the exterior panels. One section of the bris de soleil panels has already been removed. If the efforts are successful, the familiar design will live elsewhere in Orlando as a reminder of this unique landmark. Great blog and interesting information! Thanks for your efforts! Do you know if there are any updates as to what will be done with the “round building” ? Seems like they are getting pretty ahead with construction of the dr Phillips performing arts center. Thanks for your comment. Yes, check this link about efforts to save pieces of the Round Building. But as a whole it looks like it will be gone soon.